Like the sun, Izzy radiates warm light over everything and everyone; always present, consistent, and "there" for everyone, with a happy smile, bright shining eyes, her confident singing voice and a willingness to get her hands dirty—whether in the garden or caring for the school she “could not love more,” as she wrote in her application to join us for one great year. And that it has been: she was active in the Cabin for Peace and Social Justice and quick to volunteer herself when she was needed. She serenaded us with her cello and guitar and her beloved Bob Dylan tunes. No one will forget her delightful performance as Tzeitel in Fiddler on the Roof. Isabella is a legacy student (her mother is Kristin HUGHES ‘92.) She’s been accepted to Naropa University where she will pursue humanities studies. 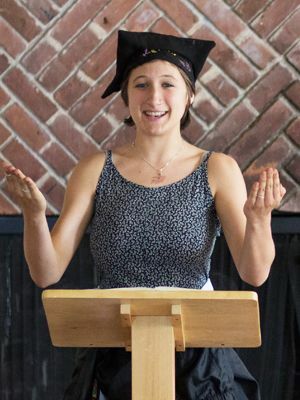 But first, she says, “what is most important to do, is to experience life outside of institutional education and learn from the world.” Izzy plans a gap year in which she will travel and work at a farm in Central America.